Unlimited is an arts commissioning programme that aims to embed exceptional work by disabled artists within the UK and international cultural sectors, reach new audiences, and shift perceptions of disabled people. Shape Arts and Artsadmin deliver it in partnership, with funding from Arts Council England, Arts Council of Wales, British Council and Spirit of 2012. In 2016 an Arts Council England’s Ambitions of Excellence award, match funded by the British Council, enabled Unlimited to extend global influence principally through co-commissions with non-UK based disabled artists. These case studies extend the learning from this work. These groups combined to form the creative carnival arts partnership Alegria Samba School as part of an Unlimited commission, comprising of disabled people with physical, hidden and learning impairments and non-disabled people, creating a very inclusive environment which welcomes everyone. This work followed a research and development trip funded by Unlimited in August 2017: VIVA Carnival Club and The New Carnival Company took part in a cultural and artistic visit to Rio de Janeiro to work with Embaixadores da Alegria, Rio’s top disability samba school. During this trip, as well as learning the important aspects of and the structure of Rio Samba Schools, the groups developed a theme for their presentation which encompassed elements of both groups’ overall focus: ‘Mata Atlantic – A Cry for Salvation, Mata Atlantica – Responsibility of Every Nation’, inspiring people to help save the rainforest and the communities and endangered animals who live in the rainforest. Following the successful research and development trip in August 2017, Unlimited provided funding for the full Alegria Samba School commission. With relationships between VIVA and Embaixadores da Alegria already strong, collaboration began right at the beginning of the project with costume design. Costumes were created together by Gina Dyer, from VIVA, and Levi Cintra, from Embaixadores da Alegria. An artists’ residency took place in January 2018 on the Isle of Wight, UK where Embaixadores da Alegria shared their expertise with VIVA, Emergency Exit Arts and Brouhaha. There were three main areas of focus for this artists’ residency: costume-making; dancing; and samba drumming. One essential aspect of the costume design was to ensure that costumes were easily adaptable to fit multiple people, for example through the use of Velcro waistbands or adapting backpacks to attach to wheelchairs. The teams then worked together to create a prototype of each costume design, which was later taken home and duplicated within their own groups. A mixture of disabled and non-disabled dancers from Embaixadores da Alegria attended the artists’ residency: Lú Rufino, the Porta-Bandeira (Carrier of the flag); Lincoln Pereira, the Mestre-Sala (Master of Ceremony); and Fernanda Honorato, the drum queen. These dancers perform essential and honoured roles in Brazilian carnival and Alegria Samba School wanted to ensure their inclusion in their presentation. Lú, Lincoln and Fernanda were teamed with UK performers who they worked closely with, running workshops to teach them about their characters, why they are so culturally important, and how to perform when in character. Workshops were run at the Isle of Wight College for a mixed ability group to create a ‘Front Commission’ piece – a theatrical dance telling the story of the Mata Atlantica (the Atlantic Rainforest). Samba drumming workshops were run by VIVA’s samba band, with members from all the visiting groups taking part. When the artists’ residency was over, the UK teams of artists took a costume prototype back to create the ten identical costumes for their section. This worked for Emergency Exit Arts, however, unfortunately, Brouhaha was unable to continue the project to completion. VIVA Carnival Club produced the rest of the costumes. Alegria Samba School went on tour, collaborating with a live samba band at each event – either Raw Samba from the Isle of Wight or Baque De Axé from London. 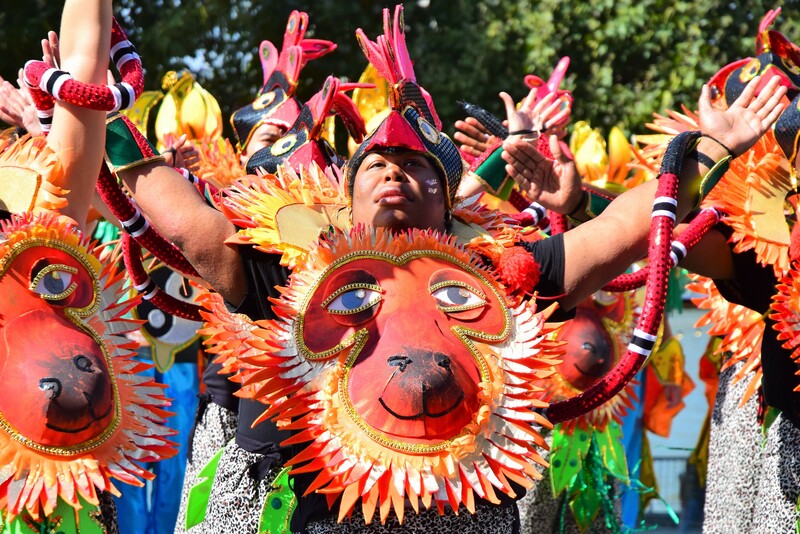 Alegria showcased their work at Luton International Carnival, Mardi Gras Isle of Wight, Newham International Carnival and Southbank Centre Unlimited Festival in the UK. Originally, they had planned to attend the Liverpool International Carnival as well, but unfortunately, this was not logistically possible. The showcase at Southbank Centre’s Unlimited Festival was particularly informative in terms of ensuring that the work is accessible to all; as well as costume-making workshops, a short parade and a static show, a touch tour and audio descriptions of the costumes were provided for visually-impaired people. Paul Davies, the creator of Embaixadores, provided a translation into Portuguese, and sign language interpretation was available. Alegria also showcased their work internationally; a team of eight visited Viareggio in Italy to share their skills with C.RE.A Cooperativa Sociale, an Italian disabled and non-disabled group. VIVA gave a variety of workshops in costume-making, performance and samba drumming, with the intention of creating additional costumes for C.RE.A to use and keep. They adapted the carnival show into a bilingual on-stage show which was performed with disabled and non-disabled performers from the UK and Italy. VIVA also visited La Cittadella where the top carnival artists in Viareggio create their carnival floats, to learn about and observe the traditional techniques used in Italian carnival, continuing their ongoing professional development. What worked well? What was learnt? The international collaboration worked well, and the groups have learnt a lot about artistic techniques and their cultural significance. The making of the costumes supported all participants in having an opportunity to contribute and develop artistically. The thoughtful costume design has meant that the costumes created have been easily adaptable so that they can be worn by multiple people. Additionally, the costume design has ensured that the costumes are very robust, as they have already been worn multiple times and continue to look spectacular. The costumed designs have captured the Brazilian ethos in terms of both the structure of the performance and the individual costumes. This project has reached a huge number of people, both through participation and in terms of audience members; thousands of people have seen the showcased work. The feedback from the performances has been overwhelmingly positive and audiences have really enjoyed the concept of disabled and non-disabled people working together. The collaboration has produced a project that can be easily built upon and expanded through adding additional characters and sections, thereby creating a potential future legacy. Finally, this project has supported the facilitation of ongoing relationships between VIVA and Embaixadores da Alegria, which will continue to develop. VIVA is looking to conclude this project with a return visit to Rio de Janeiro to work again with the Brazilian artists and performers. This visit will also be used to plan a continuation of the project. There have been some difficulties for some disabled artists in terms of participating in the performances, as some events have been long and fast-paced and aren’t necessarily adapted to suit everybody. The inclusivity and accessibility of future events for audience members also need to be considered, for example through the use of touch tours, audio description and sign language interpretation that was used at Southbank Centre’s Unlimited Festival. Logistical issues with a large number of groups: whilst it has been an amazing learning experience for the groups to work together, the logistical side of organising events for such a large number of people has been challenging. Time difference and language barriers have sometimes created issues. This international collaboration between VIVA and Embaixadores da Alegria has provided an opportunity not only to share cultural and artistic traditions and methods but also to open up a conversation about how different people can contribute in positive ways. It has reinforced the idea that accessibility is essential for carnival and highlighted just how many barriers disabled artists can face. This collaboration has demonstrated a hugely positive response to disabled and non-disabled artists working together. Furthermore, the integration of disabled and non-disabled artists has created a very uplifting environment for everybody involved. For many of the participants, this has been their first experience working with and getting to know people with a learning disability, and many have commented that it has been very enjoyable and fulfilling to work together in this way. The inclusion of people with all kinds of abilities has highlighted the importance of being aware of every individual’s needs and ensuring that these are facilitated. It has been important to be thoughtful about how to support everyone and comprehensively pre-plan appropriate differentiation, for example by providing information on different coloured paper for those with dyslexia, giving specific and advanced information of the events for those with anxiety, or ensuring that there are chairs and rest stops for those with mobility issues. Knowing the group and their individual needs are essential in enabling and empowering every individual, rather than allowing disability to be a barrier. This has been demonstrated in many ways throughout the project. For example, during the making process, the group had a variety of making sessions, flexible deadlines and provided access to transport to and from the workspace, to accommodate to those with invisible disabilities such as anxiety or fibromyalgia. For costume makers with learning disabilities, accessible tasks were allocated, and the larger tasks were broken down to make them achievable within the time allowances. When attending each of the events it was also imperative to ensure that the participants would all be able to access them. In this aspect, Southbank Centre’s Unlimited Festival was particularly positive; as Alegria was more in control of the organisation of this event, it was possible to put in place all the appropriate differentiation such as controlling the length and route of the parade to ensure it was accessible for everyone. This project has also exemplified the enormous benefits that international collaboration can have in learning and sharing different culture, artistry, methods and techniques. It created a space for every group to develop and improve their own techniques, through the sharing of cultural aspects of their art and understanding not only how different people create their art differently, but also why. Finally, this project has highlighted the need for events to be accessible and inclusive for both the participants and the audience and has demonstrated some of the ways in which this can be achieved.